Sathiguru Amardaasjee Maharaj is saying sabadh sachai sach sohilaa - sach: again and again in the shabad you will hear sach, sachai, sachaa - these words. What is Truth? That thing is True which is eternal. Everything which is going to fall away, which is going to decay, which is going to be destroyed, is false. How can you attach yourself to falsehood? Sathiguru Maharaj jee is showing us the Eternal Truth. Sathiguru Maharaj jee is showing us the Eternal Truth. Maharaj jee says, sabadh sachai sach sohilaa - sach Eternal sohilaa - eternal peace, eternal happiness which never ends is only found through sabadh sachai - through the sabadh of sachai - of that eternal Waheguru. If you attach yourself to falsehood then you are only going to get false peace. If you attach yourself to that which is going to fall away then your peace will always be falling away from you. If you attach yourself to Waheguru, to that Guru who is immovable, who will never perish then your peace will be immovable whether around you there is pain, happiness - whatever there is the inner peace will remain undisturbed. Sabadh sachai sach sohilaa - only through attaching to the Word of the sabadh - to the Word of True Lord Waheguru can you find eternal peace. Jithai sachae kaa hoe veechaaro raam - where do you find this peace? - Where sachae kaa hoe veechaaro - where the understanding, where the wisdom of that sachaa Waheguru, of that eternal Lord God is understood: in the company of the holy congregation - of the saadsangat. That is where you will find this true shabad, this true Word of the Lord God, Waheguru. If you dhaarae - if you enshrine in your our - in your heart this saach - this eternal shabad of that Waheguru. If when you are getting up, sitting down, day in and day out, constantly contemplating the Guru's shabad - the Guru's words with your tongue and with your mind, chanting the shabad, the Guru's mantar - Waheguru, Waheguru, then what happens? Houmai - your ego, sabh kilavikh - all of your sins are kaattae - are cut through, are eradicated, are taken away, are destroyed. The name of God is like the match which will set fire, one tiny little match can set fire to the whole forest. The forest of our sins, all of that wood will be burnt away in an instant by enshrining the true shabad, by enshrining the guru's shabad within our hearts. Saach rakhiaa our dhaarae - those who have kept this saach - this eternal word of Waheguru in their our - in their hearts dhuthar thaarae - they've been thaarae - they've been liberated from this dhuthar - from this world. Fir bhavajal tharan n hoee - then they don't have to enter into bhavajal - into this ocean of fear again and try and tharan - and try and swim across it. They are saved by Waheguru jee, by the Guru: Siri Guru Nanak Devjee takes them across. Because the true Guru is sachaa - is eternal and speaks the truth, is one with the truth. Sachee baanee - Gurujee is telling us that know this: that the Guru and the Guru jee's bani are both eternal, are both never perishing, the both one and the same. The true Guru resides in the baanee and the baanee emanates from the true Guru. Jin sach vikhaaliaa soee - the Guru is the door to the mansion of God, jin sach vikhaaliaa soee - the Guru's baanee, the Gurbani has vikhaaliaa - has shown us that Waheguru, that Lord God, that eternal truth. What is the way of merging in? If you want to samaavai - merge in with that saach - with that saachae Waheguru then saachae gun gaavai - sing the praises of that true eternal Waheguru. Sach vaekhai sabh soee - by singing the praises, singing the praises your ego will be burnt away, your sins will be burnt away and in sabh you will see that sach - you will see that eternal God, vaekhai - with your own eyes you will see that eternal God pervading. Sathiguru Amardaasjee says saachaa sahib saachee naaee - the master, Waheguru is saachaa - is eternal, is the truth, saachee naaee - His glory, the name of God is saachee - is the one who will take us into that truth. Sach nisathaaraa hoee - only through attaching ourselves to the eternal Waheguru, to the eternal shabad, to the eternal Guru can we be nisathaaraa - can we be saved, can we be liberated. The eternal Guru has bujhaaeiaa - has revealed this understanding to me of saach - of eternity. I've realized that jag rachanaa sabh jhooth hai - Guru Tegh Bahadur Jee tells us; the whole creation is created just to be destroyed. In another salok Guru Tegh Bahadur Jee says, Jo oupajiou so binas hai - that will be destroyed. Path raakhai sach soee raam - those who have understood the eternal understand of the Guru's shabad Waheguru jee Himself raakhai - protects their path - their honor in this world and the next. Their bhojan - their sustenance is sachaa - is the name of God. What does that mean? That their soul is nourished through the name of God, bhaao sachaa hai - and their bhaao - thier love is with the eternal Lord. They are not in love with the falsehood of the world, there are in love with the true Lord. Sachai naam sukh hoee raam - O people of the world if you want saach - if you want true peace then attach yourself to the sachai naam - to the true, eternal name of the Lord. Those who have attached themselves to the eternal Waheguru their Light is merged into the Eternal Light. Sach samaaee - they merge into the eternal Waheguru. sach naae paragaasaa - but how is this paragaasaa - this illumination, this enlightenment found? - Only through the sach naae - only through the True name, through the name of Waheguru, only through the Eternal naam. Those who have jaathaa - who have known sach, who have tasted that eternity, sae sachae hoeae - they are merged in with it. Those who have repeated the naam - the name of the Lord they've become One with Waheguru. Anadhin sach dhiaaein - what is the way of doing this? Anadhin sach dhiaaein - meditate upon sach - upon that sach naam, upon that Eternal name. Sathiguru Amardaasjee says, sach naam jin hiradhai vasiaa - those people who in their hiradhai - who in their heart have the True name - the Eternal name of Waheguru naa veeshurr dhukh paaein - they are never separated again and they never suffer pain. Sathiguru Amardaasjee says, the baanee - the words of the Guru are complete sach - are complete truth, are complete encapsulation of eternity. Sachae gun gaavehi - sing the praises of that Waheguru. thith ghar sohilaa hoee raam - those people who sing the baanee - who sing the Guru's words, who understand, who love and praise that Guru's word at all times, in that ghar - within that home, within that body there is true sohilaa - there is true glory, there is true happiness, there is true peace, true anand, true ecstasy. The gun - the praises of Waheguru are niramal - meaning without mal - without any filth, they are immaculate. What do the gun - the praises of Waheguru do? If you sing those immaculate praises they wash away all your sins as well. Than man saachaa - they make your body and your mind attached to saachaa - to truth. Your mind and your body are both attached to the truth through singing the praises of Waheguru. vich saachaa purakh prabh soee raam - you realize that vich - inside all of us there is that sachaa purakh - that eternal Waheguru. Then those people who are attached to Waheguru they understand that sabh - in all sach varathai - that eternal Waheguru is working through all. Sacho bolai - only that Waheguru is speaking through all, jo sach karai s hoee - whatever that eternal Waheguru wishes that happens. Wherever they look theh sach pasariaa - they see that eternal Waheguru pervading, avar n dhoojaa koee - they don't see anyone else, no other. They realize that everything is created from that eternal Waheguru, sach samaavai - all merges in with that Waheguru. Those guramukh piaarey they are created from that Waheguru, they merge in with that Waheguru. Mar janamai dhoojaa hoee -only for those people who are stuck in the love of duality, in the love of this world, in the love of falsehood, only those are the ones who die and janamai - born and die again and again, in rebirth. Sathiguru Amardaajee says sabh kish aapae karathaa - everything that karathaa - that eternal creator Waheguru is pervading through all. Gurujee tells us in that word karathaa - in that creator word, remember if we say Waheguru jee is all that doesn't mean that if a tree dies Waheguru jee has died. If some of the creation is wiped out then is Waheguru jee wiped out, no. Waheguru jee pervades through them all yet is separate from them all. Maharaj jee says sabh kish aapae karathaa - Waheguru jee is the creator, Waheguru jee cannot be destroyed. Waheguru jee is pervading through all, yet beyond all. Aap karaavai soe - Waheguru jee is the One who acts through all, He is the cause of all causes. Within their ghatt - within their hearts, antharae - deep inside them saachee baanee - they contemplate the true words of the Guru's shabad, Guru's baanee saacho aap pashaanae raam - through the Guru's baanee they come to understand their aap - their true self. They realize that this body and this mind are not my true identity, truly within there is a soul and that soul is a light of that great Eternal Light. When they realize their True Self, that Light, that jot, that aatmaa, that soul thaa sach jaanehi - that is the only way of jaanehi - of knowing truly sach - eternal Waheguru. saachae sojhee hoee - this is the way of getting the understanding of that True Waheguru, that Eternal God. The shabad of the Guru, the Guru's Word, the Guru's mantar is sachaa - is the One that will take us into the Truth, sachee hai sobhaa - the praises of Waheguru are true. If we praise the world then it's not true praise because what we are praising will fall away, will be destroyed, will fall apart. 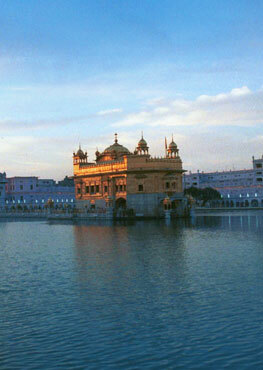 But if we praise Waheguru, Waheguru jee's is eternal and that praise blesses us with eternity as well. Saachae hee sukh hoee - the only way of getting true peace in this world is attaching yourself to the eternal Waheguru. The devotee's of Waheguru, of Akaal Purakh, of God are rathae - completely imbued with saach - with that eternal Waheguru. Eik rangee - they only have one love pervading through their body, they are not in love with the world and in love with Waheguru. They only have that one love inside them dhoojaa ran n koee - they do not have any other rang - any other love within them. That one love completely engulfs them, just like fire completely engulfs the wood which is put in it and the wood becomes the form of that fire. In the same way they are completely engulfed in the love of that Waheguru. Sathiguru Amardaasjee says, Naanak jis ko masathak likhiaa - those who upon their masathak - upon their forehead have great destiny written by Akaal Purakh, those who Akaal Purakh jee brings towards Himself this sach paraapath hoee - that Guramukh piaaraa is blessed with paraapathee - with receiving sach - the understanding of that Eternal Waheguru.